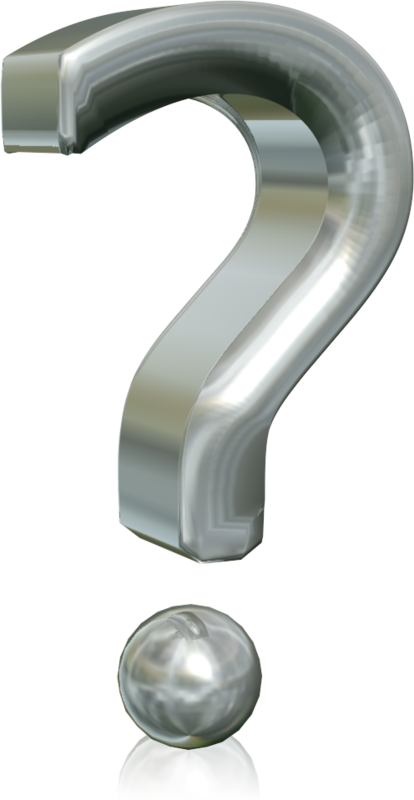 My question in the last post (Who’s next?) has now been answered. Instead of a festival devoted to a particular composer the 2015 – 2016 San Antonio Symphony season will have a “Las Americas Festival”. The possibility of such a festival had crossed my mind but I ruled it out largely because of the steady exposure to new (mostly) American works we have enjoyed this season through the commissioned American Preludes performed as the first work at each concert of the 2014 – 2015 75th anniversary classical series. Mike Greenberg has provided a helpful overview of the season highlights. He is particularly pleased we will have the world premiere of a cello concerto by Jeffrey Mumford. I wasn’t familiar with any of Mr. Mumford’s music, so I listened to a 90 minute representative sampling of his works released by Albany Records as TROY1473-74. While I’ve heard less accessible serious modern compositions, I’d have to say the most attractive parts of Mr. Mumford’s compositions are the titles. “In forests of evaporating dawns” is particularly evocative. The season includes a brief nod to the 150th anniversary of Jean Sibelius’ birth but nothing by Carl Nielsen who shares the same year of birth. (By the way, Seattle is currently presenting a festival of all seven Sibelius symphonies.) Mr. Lang-Lessing has previously programmed Mahler symphonies for either the opening or closing concerts of the season. The Mahler 1st Symphony closes the 2015 – 2016 season. If I recall correctly Mr. Lang-Lessing played the same symphony in the concert that began his tenure as music director. Richard Strauss’ opera Salome, performed in a fully staged production by Opera San Antonio, was a vital part of the recent Strauss Festival. I can’t think of any American operas the young opera company would be equipped to undertake. Philip Glass or John Adams seem out of the question. How about Gershwin’s Porgy and Bess? I don’t know how difficult it is to stage. It would fit in pretty well with the Festival and should be popular enough. One personal complaint about the new season: There is no Bruckner symphony! It’s about time the symphony plays either the 5th or the 9th. The 8th would be wonderful, but maybe that’s asking too much. We can dream. One welcome and very successful innovation San Antonio Symphony Music Director Sebastian Lang-Lessing introduced in 2010 was an annual festival focused on the works of a single composer. So far we have had festivals featuring the works of Beethoven, Tchaikovsky, Brahms, Dvorak and Richard Strauss. Only works by the featured composer were performed during the first four festivals. This season (2014 – 2015) took a significantly different approach. In addition to works by Richard Strauss the works of other composers who either influenced Strauss or were influenced by him were included in the programs. The selections in a concert were usually related by a theme. For example, the waltz was the unifying link for an evening consisting of works by Johann Strauss Jr., Richard Strauss and Maurice Ravel. I find it interesting to speculate on the festival composer for 2015 – 2016. If we look at composer birthday anniversaries there are two notable composers who were born in 1865: Jean Sibelius and Carl Nielsen. A festival of both composer’s works could be quite interesting. Both wrote some exceptional symphonies, tone poems and choral works. There are, of course, many great composers who haven’t yet been featured in a festival. I think some (Bach, Mozart, Haydn come to mind) would be unlikely because they use limited orchestral resources. Mr. Lang-Lessing has shown a preference for romantic period works. Richard Wagner comes to mind as a possible candidate. There are a number of standalone orchestral works but no symphonies or concertos. A gala concert of opera selections and/or a semi-staged portion of an opera would be doable. Opera San Antonio is not in a position to successfully produce a fully staged performance of any Wagner opera. This is a long shot, but I think an Elgar festival would have a lot to offer. There are two symphonies (and an unfinished symphony in a performance version), a violin concerto, a cello concerto, a number of large-scale choral works and several fine overtures. In addition, there are enough chamber works to give local chamber music organizations some festival-related concert material. However, I don’t know that Elgar has enough audience appeal to make such a festival sufficiently attractive. Festivals based on a couple of composers who wrote (almost) only symphonies would be a real challenge, especially for the audience. Symphonies by Anton Bruckner and Gustav Mahler have been programmed fairly frequently in recent years. A festival of either composer’s works would be too heavy for sustained interest. 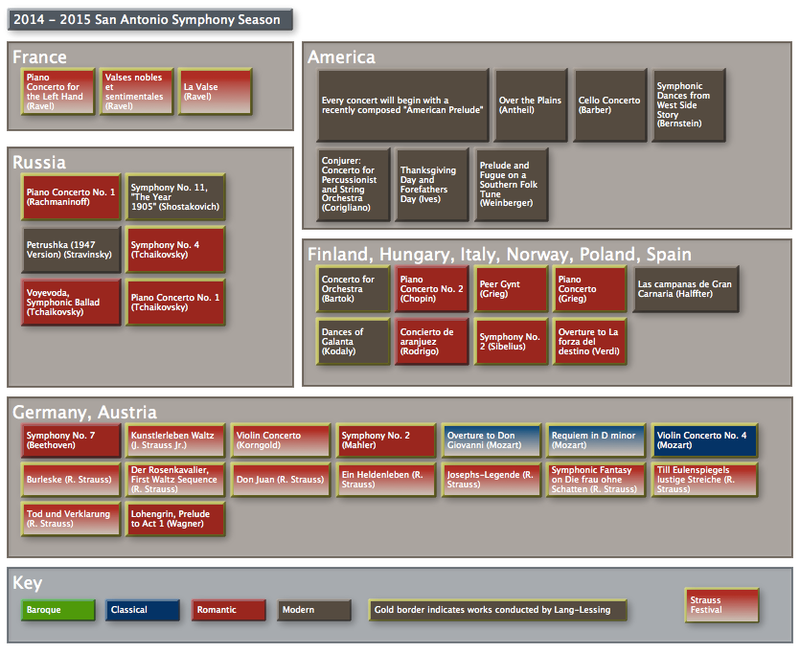 It shouldn’t be long before the San Antonio Symphony announces the schedule for the next season. I’m looking forward to the announcement and expect I’ll be surprised by the choice of composer for the 2015 – 2016 festival. 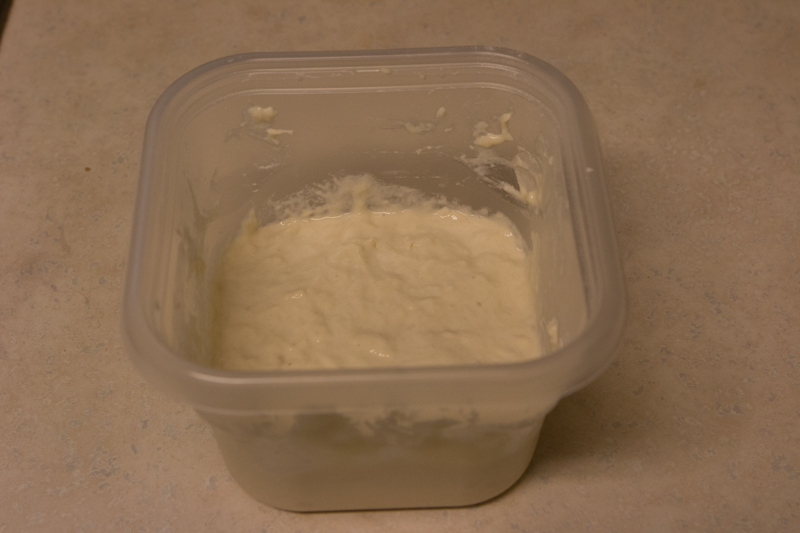 A sourdough starter is a minor miracle. 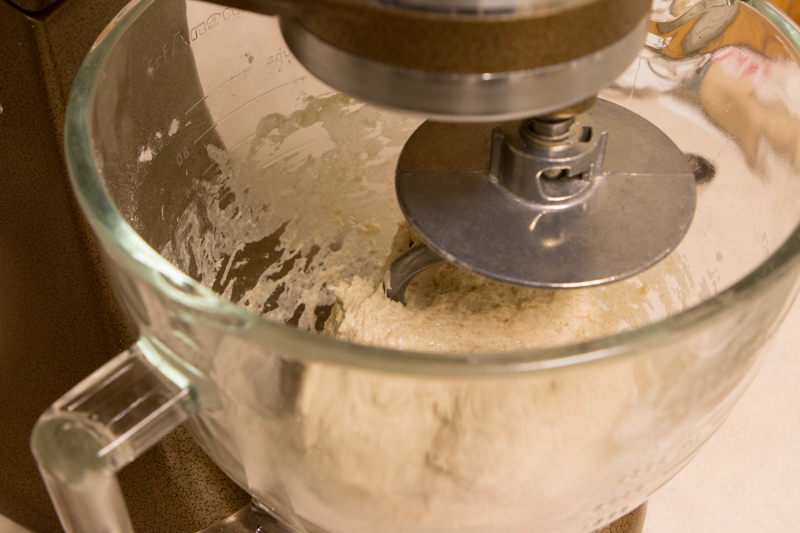 Combine flour, water, and a mixture of natural bacteria and yeast, wait a few hours, and a dramatic change occurs! The teeming microscopic life within the wet mass of flour find an abundant source of nutrition and begin producing a bewildering array of flavorful chemical compounds and gaseous carbon dioxide. Within a short time the inert lump has drastically increased in volume. Life has asserted itself in an unmistakable way. The starter has just been fed. 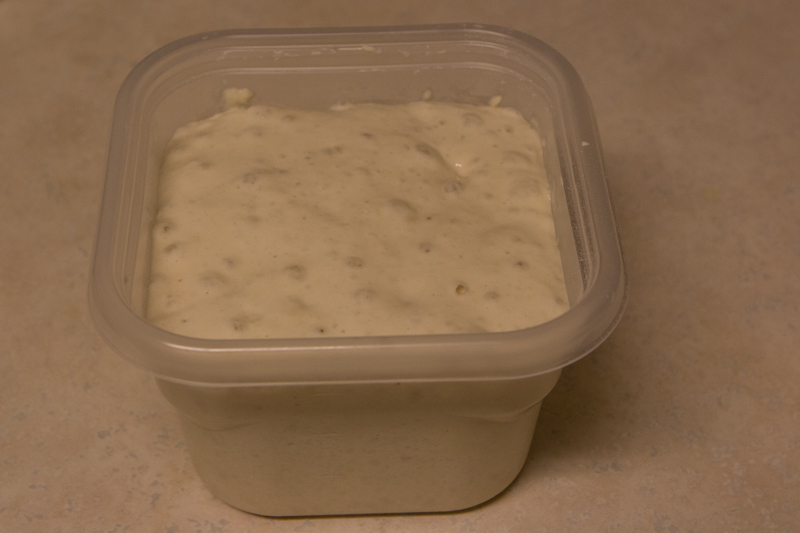 2 ounces of starter, previously stored in the refrigerator, are mixed with equal weights of water and flour. Only chlorine-free water should be used since we don’t want to inhibit the bacterial growth. I use a Brita faucet filter. Here is the same starter six hours later. The yeast have produced a enough gas to increase the volume more than double. At this point the starter has a mild acidic odor, somewhat fruity and not at all unpleasant. For the most reproducible results the ingredients are weighed. I use measuring spoons for the salt, but everything else is weighed. I’ve found this Oxo scale to be very accurate and reliable. 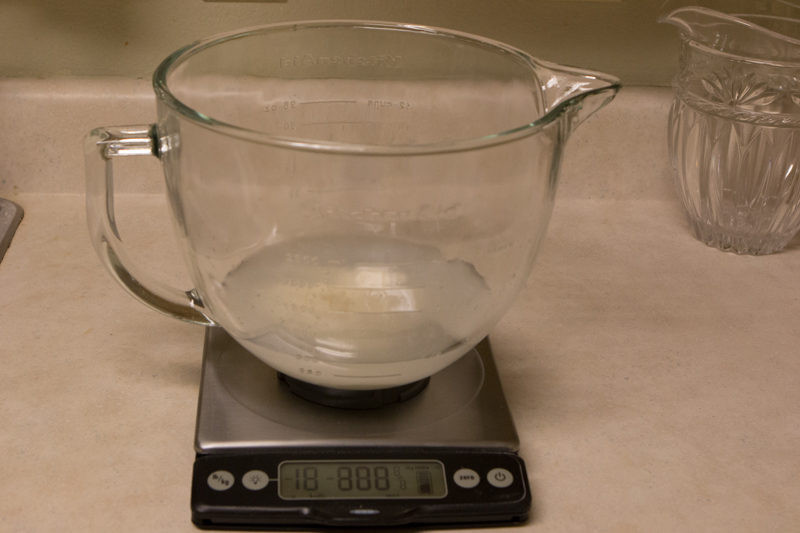 Since the scale has a 12 lb capacity I can weigh directly into the mixing bowl. 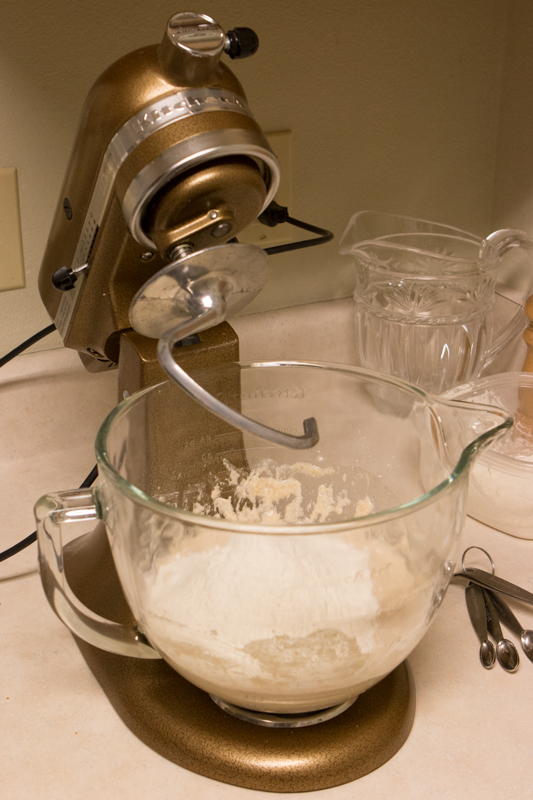 I’ve mixed and kneaded the bread by hand several times, but find the mixer with a dough hook is faster and results in a much easier clean-up. I mix at lowest speed for seven minutes. 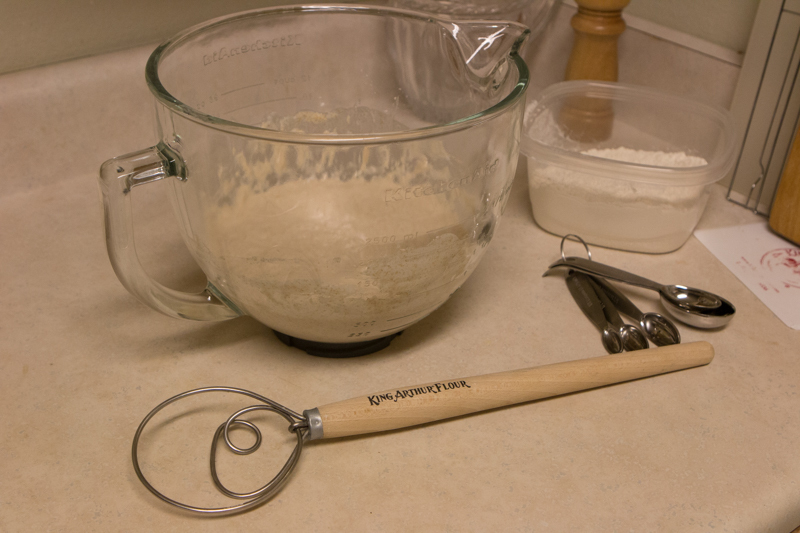 The dough comes together around the dough hook and cleans the sides of the bowl, but remains in contact with the bottom of the bowl. After 7 minutes the dough is somewhat sticky but isn’t difficult to handle with a little flour on the hands. 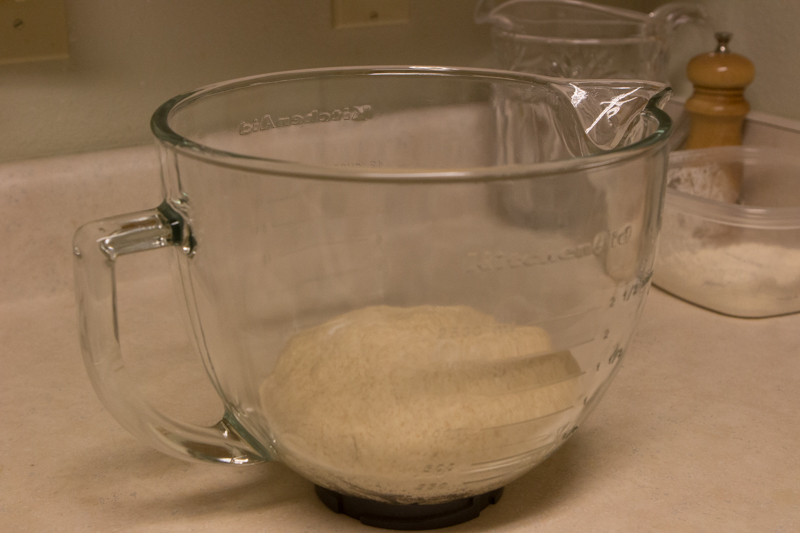 I gather the dough into a ball, clean out the bowl, return the dough to the bowl and cover the bowl with plastic wrap. Even at 61F the dough has risen more than double. 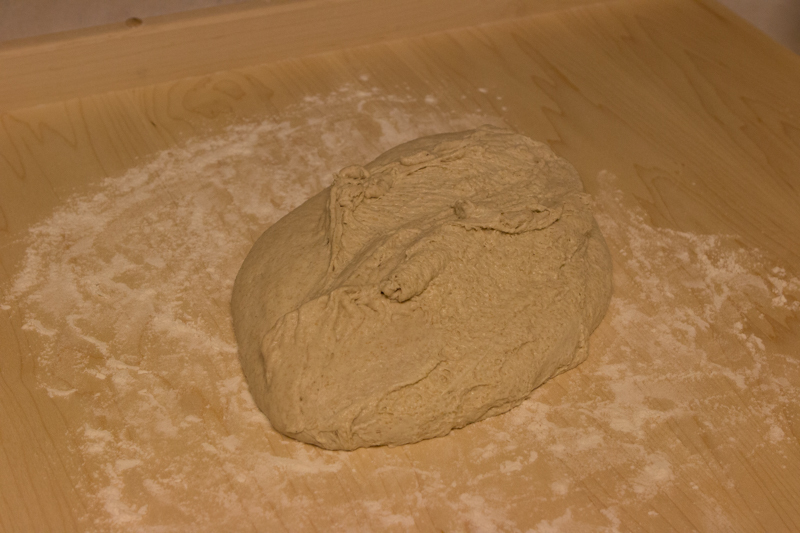 The dough is scraped from the bowl onto a lightly floured work surface. 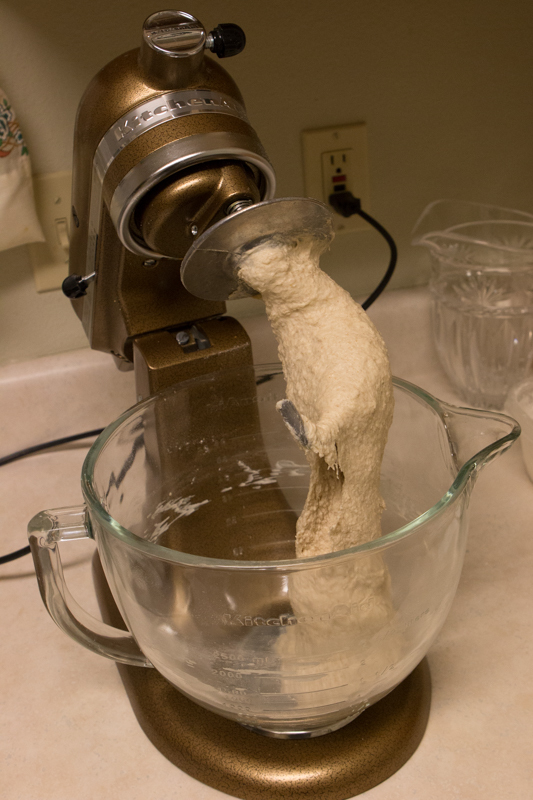 The dough is handled gently so it will not totally degas. 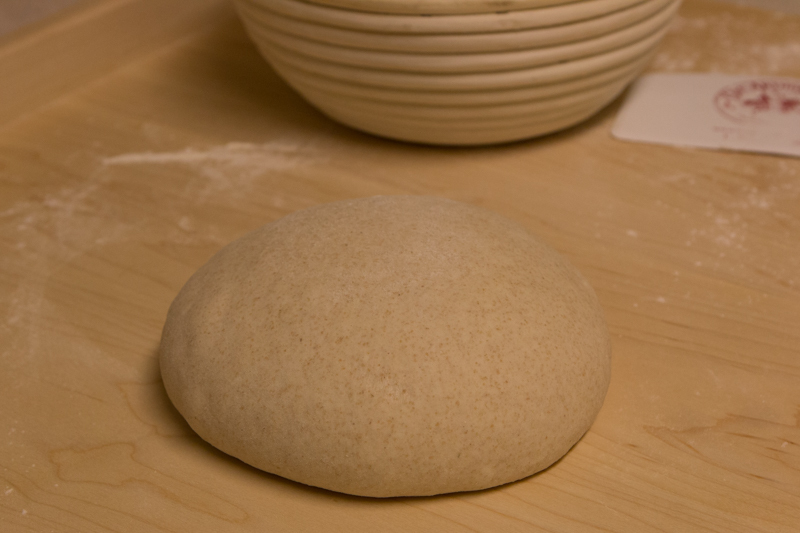 Initially the dough is very soft, pliable and sticky. A little flour on the surface and the hands make easier to handle. 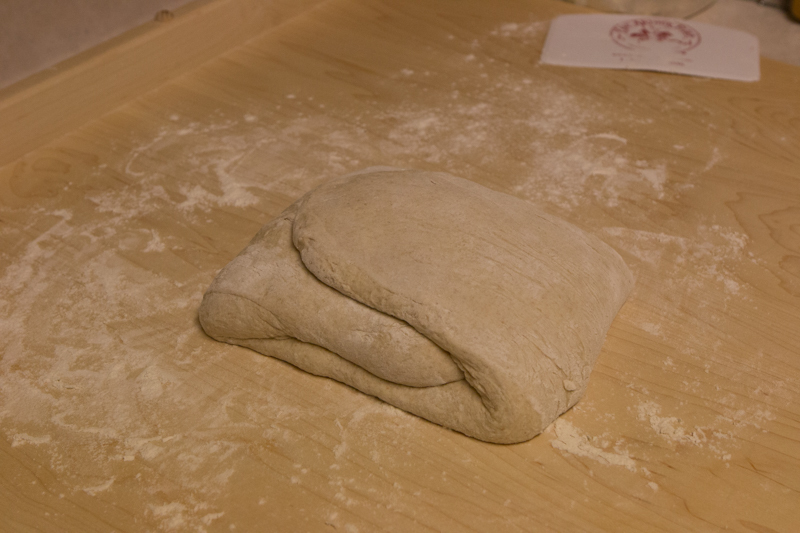 Some structure is introduced to the dough by allowing its own weight to stretch it out, then folding it over. 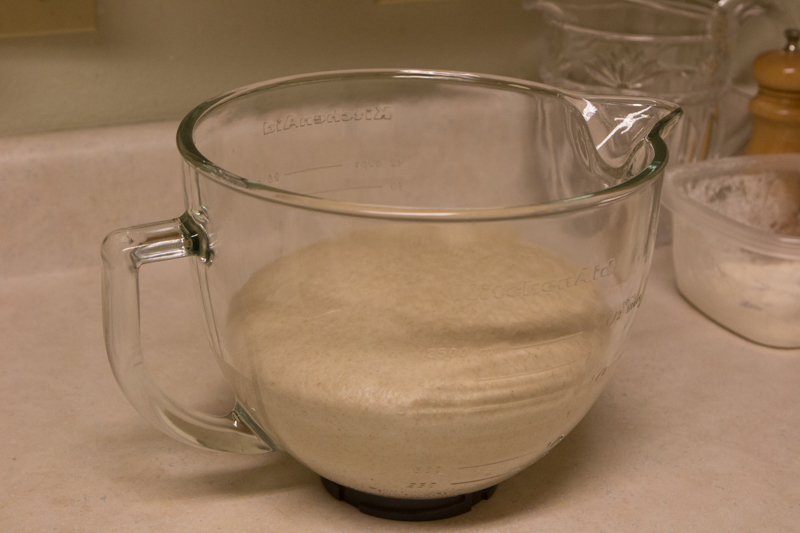 This is repeated a few times after which the dough is much easier to gather into a stable round loaf shape. 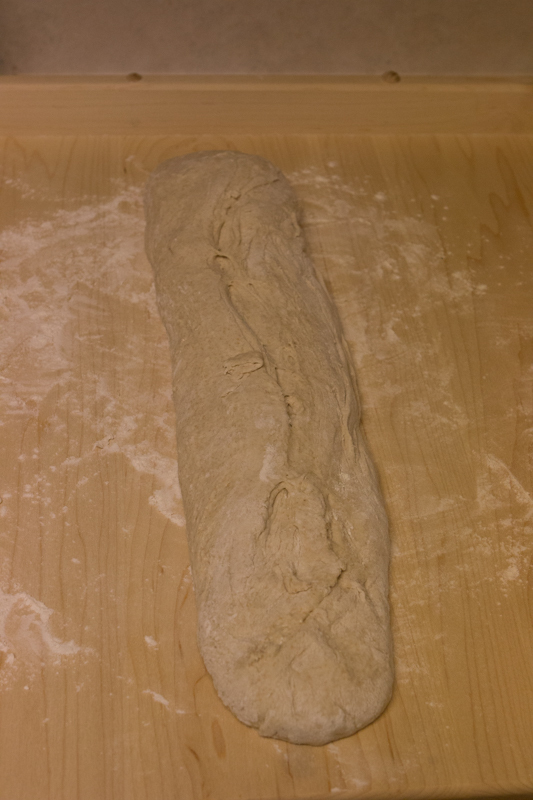 The final tightening of the loaf is accomplished by dragging the loaf on the unfloured board, rotating it to evenly distribute the tension. Please go to this blog post for the rest of the story. I started baking sourdough bread a few months ago. I’ve baked bread with commercial yeast for decades, but I always wanted to try my hand at sourdough. This Website provided much of the information I needed to get started. After trying to create my own starter with no success I bought a San Francisco sourdough starter from this company. 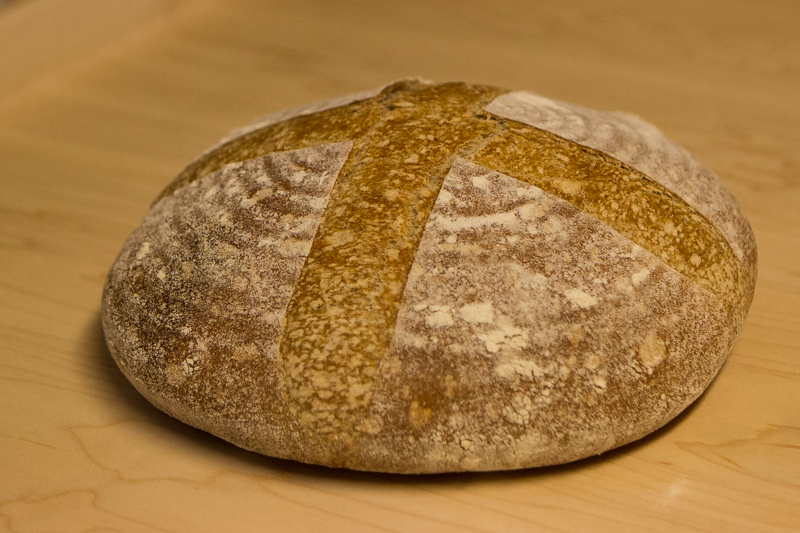 I took a few photos while I was making a loaf of San Francisco Sourdough Bread last Friday. The photos start with the formed loaf. I’ll cover the earlier steps of the process in a future post. The proofing basket, also called a banneton or brotform, is made of natural cane. 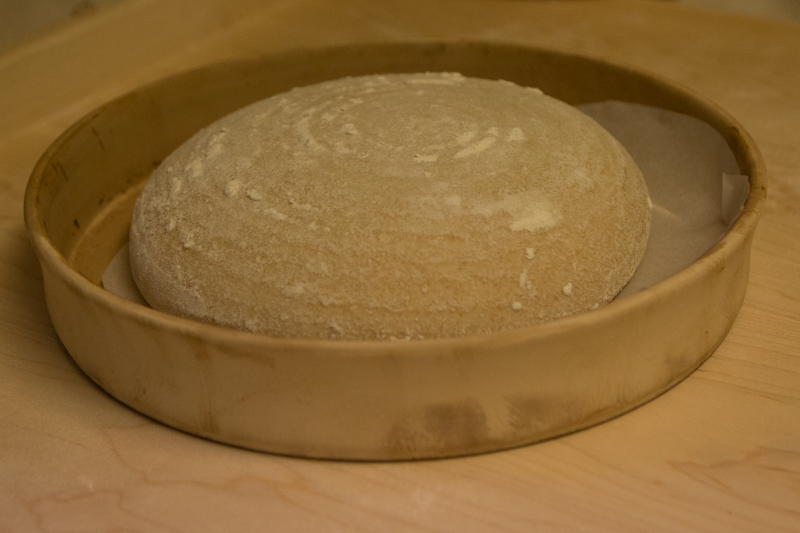 The interior of the basket is generously sprinkled with flour to keep the dough from sticking while it rises. The rise in the basket takes about 2 hours. 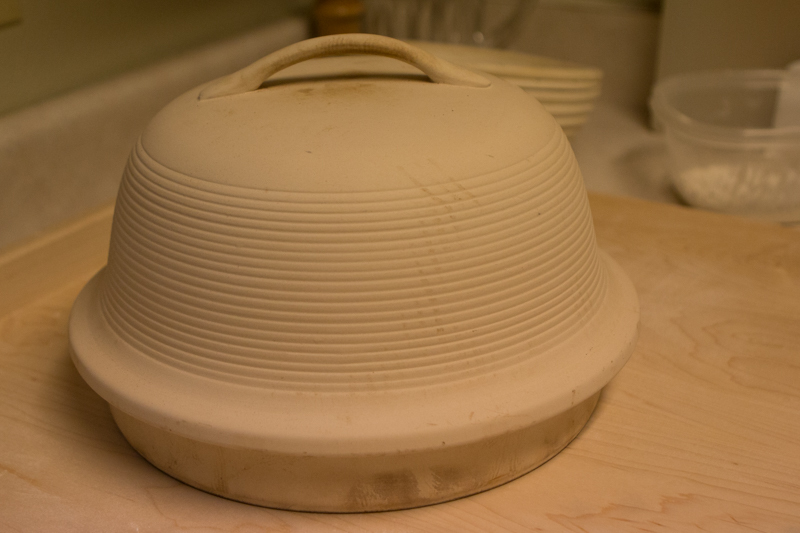 To maximize the oven rise and crust formation in an ordinary oven I use a stoneware enclosure called La Cloche, which is French for “bell”. 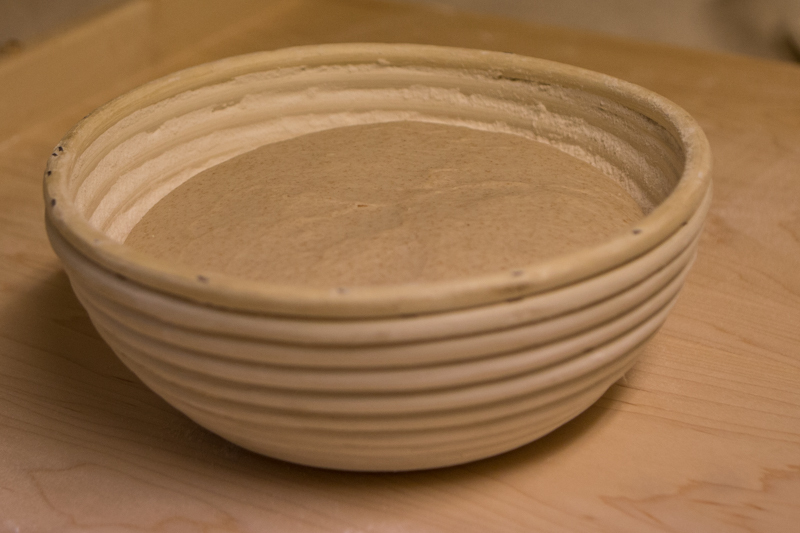 I transfer the dough from the proofing basket to the room temperature stoneware, but some bakers prefer to preheat the stoneware.The closed container traps some of the moisture and provides radiant heat from the stoneware lid. This is similar to the environment in a traditional masonry oven. 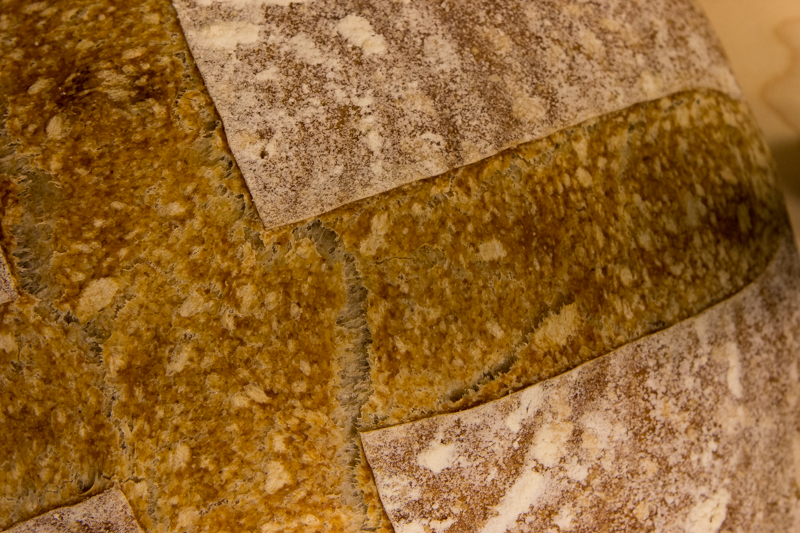 The loaf is slashed with a sharp blade so when it rises in the oven the crust will separate in a predictable manner. There are many ways of slashing a loaf. I’ve been using a simple “X”. 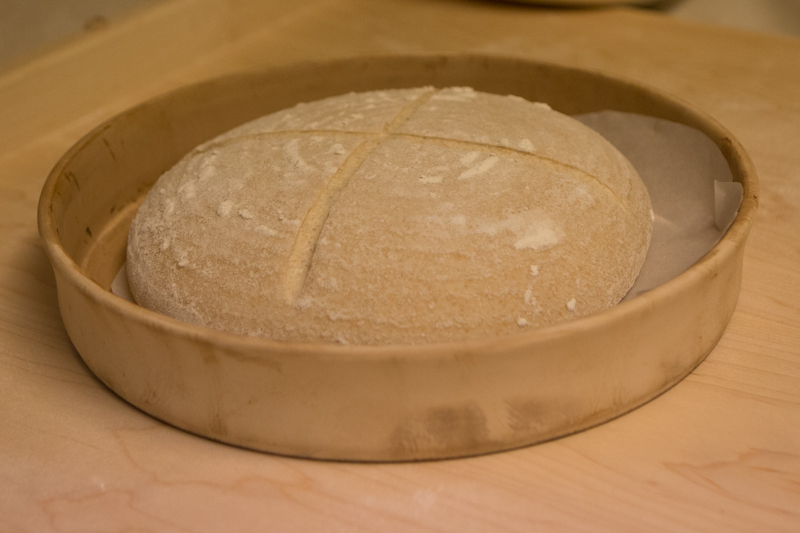 The bread is baked in a preheated 450F oven for 30 minutes with the lid on. The lid is then removed, the temperature is reduced to 400F and baking continues until the crust is browned, usually about 10 or 15 minutes. This bread is especially good toasted. The mild sour flavor blends perfectly with butter. The crust has a nice crunch but isn’t too tough or chewy. The San Antonio Symphony has announced their classical series for the first season in the new Tobin Center for the Performing Arts. There will be a slightly different approach to the annual Festival this season. Previous festivals have been devoted entirely to the works of a single composer. This year we will have a Richard Strauss festival but some festival concerts will include works by other composers who either influenced Strauss or were influenced by him. 2014 is the 150th anniversary of Strauss’ birth. San Antonio Symphony founding director, Max Reiter, was a friend of Richard Strauss and the symphony performed the American premiers of several Strauss works, including three of the Four Last Songs with soprano Kirsten Flagstad. Flagstad had performed the world premier of all four songs with conductor Wilhelm Furtwangler, but found Fruhling too demanding on her aging voice and never performed it again. 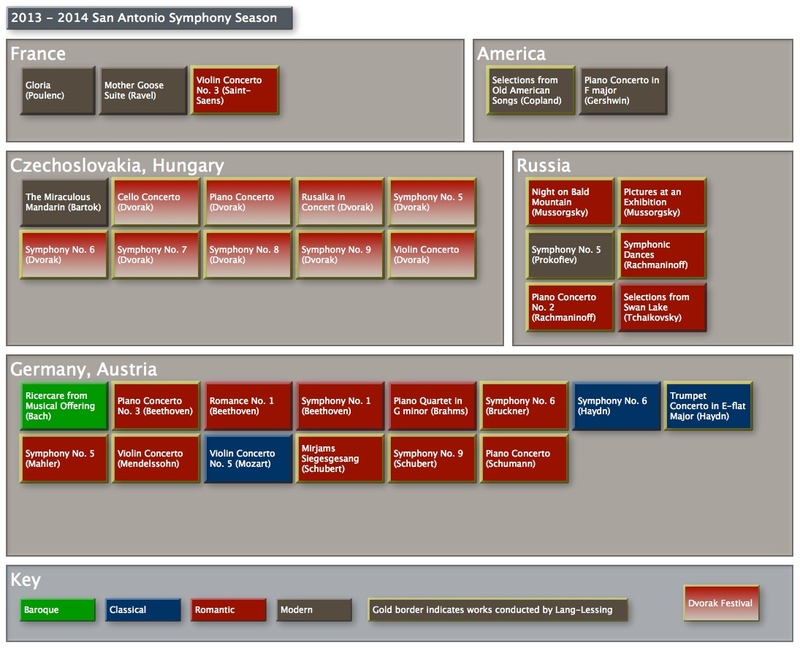 The last few years I’ve created maps summarizing the symphony’s classical season. Here is the one for 2014 – 2015. Click to view a larger version. I’ve also created a timeline using the same data, showing the approximate dates the compositions were completed. Click here to view the pdf file. The data map and timeline were created using Tinderbox software. Each new season I make minor modifications and the software does the work of creating the map based on the data I enter. The addition of a StartDate for each work was all that was required to generate the timeline. By the way, the dates for the timeline came from either Wikipedia or Naxos Music Library. Last season (2011 – 2012) the musicians of the San Antonio Symphony did an extraordinary thing. Lacking a new contract, they made a gentlemen’s agreement with the symphony administration to perform the season under the same terms as their previous, expired contract. They did this in hopes of encouraging the momentum new conductor Sebastian Lang Lessing brought to the symphony. Now, with the opening concert of the season on October 5, the players are once again without a contract. Jack Fishman, Symphony CEO and President, was reported as saying the contract negotiations will start “very, very soon”. 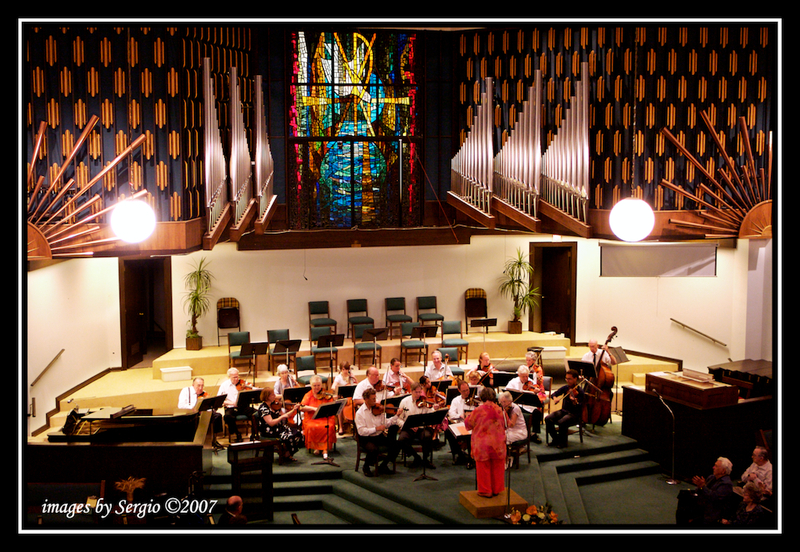 The San Antonio Symphony Players Association has a website and a Facebook page. John Clare of Texas Public Radio interviewed the members of the players’ negotiating committee. The full interview can be found at the bottom of this page. On that page you’ll also find a link to the letter the players’ negotiating commitee sent to the symphony board. The negotiations cannot start soon enough. The players have shown incredible dedication, sacrifice and patience. We all hope the organization will be able to move forward into an era of stability and fair compensation for these vital members of our arts community. If you use liquid laundry detergent you may be using a lot more than necessary. Let’s take a look at the measuring cap from some Tide Liquid. There are three lines, numbered 1, 2, and 3. 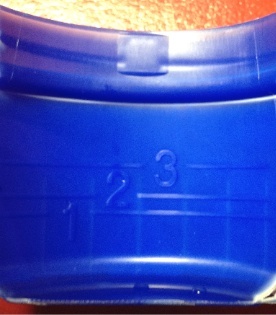 The instructions on the container recommend for a medium load, fill to Line 1; for a large load, fill to Line 2. Use more for heavily soiled loads. So ordinarily we shouldn’t need more than Line 2. What volume, in ounces, does each line represent? I’m glad you asked that. Here are the answers. I’m defining shoulder as the line where the threaded part of the cap begins. I wouldn’t be at all surprised if most people routinely fill above Line 2. I would guess that it isn’t unusual to fill between Line 3 and the Shoulder. If you do that you’re using about twice as much product as the manufacturer recommends. Good for the manufacturer (why do you think they supply such large caps?) but bad for you. Pay attention to the instructions and save some money! The 50 ounce bottle of Tide is supposed to be enough for 32 loads of laundry. What volume, then, are they using for a typical load? 50 divided by 32 gives 1.6 ounces, Line 1 for a medium load. Now you know why the bottle never seems to last for the labeled number of loads!